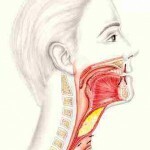 The larynx, also called the voice box.is the part of the body that allows to produce sounds and speech. The larynx contains the vocal cords (glottis), which vibrate when air passes through..
smoking: The risk of laryngeal cancer increases up to 30 times for smokers.. 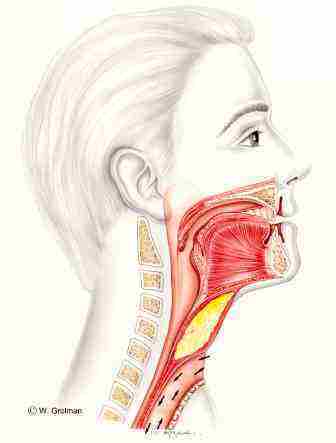 The symptoms of laryngeal cancer depend on where in the larynx the tumour is located. Cancer on the vocal cords can often be detected early because the main symptom is hoarseness. Most people go hoarse from time to time, but if the hoarseness doesn’t go away in two weeks, it should be suspected. Difficulty eating: After surgery, it may become difficult to swallow certain consistencies of food. Those undergoing radiotherapy may have trouble swallowing or even chewing. Chemotherapy can cause nausea and vomiting. A good, healthy diet is vital when recuperating from cancer, so it’s important that adequate nutrition be maintained throughout the treatment. Cancer spread: It’s possible that the cancer may spread to other areas of the body.